The Daily Mile is a social activity, wherein the children run or jog – at their own pace – in the fresh air with friends for 15 minutes every day. If your child is doing The Daily Mile at school you can support this by both encouraging their confidence in running and moving outside with them out of school hours. 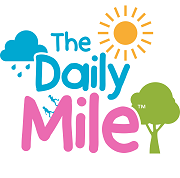 Parents say that The Daily Mile helps children to eat and sleep better and that often they become young ambassadors for whole family fitness! Please click on the picture for link to the website.